Circle of Welcome - Our Savior's Lutheran Church and Preschool. 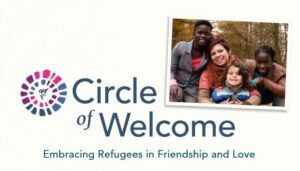 The Refugee Circle of Welcome Mission is a one year commitment to support a family who is fleeing their native country because of safety concerns, and is resettling in the US. The goal is to provide financial, educational, and emotional support so that, at the end of a year, they will be able to successfully integrate into our local community. This mission is scheduled to run from October, 2018 through September, 2019, and is run under the auspices of Lutheran Community Services Northwest.